Railguns are impractical weapons because of the massive electrical power needed, because the projectile can have no explosive, because the projectile is small, and because it has no greater effective range than a standard 5-inch naval gun. These issues are never discussed because attention is focused on overcoming complex reliability challenges for this "future weapon." Railguns have been in development since 1918 and current prototypes (one pictured) still require major advancements in metallurgy since the rails “barrel” wear out after a few shots with a Mach 6 muzzle velocity. This problem with hypervelocity guns remains since World War I when the Germans employed a 211mm "Paris Gun" with a muzzle velocity of Mach 4.8 that allowed a range of 130 km (81 miles). Each shot wore away a considerable amount of steel from the bore. After 65 rounds had been fired, the huge barrel was sent back to a Krupp factory and rebored. The US Army spent a decade developing an anti-tank rail gun, but decided it was too costly, complex, and offered less capability than current tank guns. 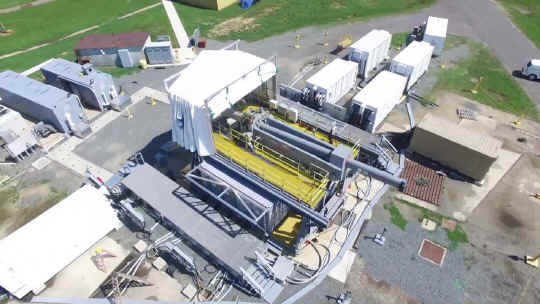 The Army determined that railguns are less accurate because of the "aerodynamic jump" from the armature, which is seen as yaw in slow-motion videos of current Navy rail guns and worsens as rail alignment degrades with each shot. The US Navy has spent over a billion dollars to develop a ship version that was supposed to be deployed in 2011. Failures resulted in even more funding and two huge railgun prototypes continue tests. While the railgun size is reasonable, huge banks of capacitors are needed. Railgun salesmen say they are safer since no propellant is needed, yet large charged capacitors are explosive if damaged. They also brag that more railgun projectiles can be carried since they are smaller, safer without an explosive warhead, and cheaper without electronics for course corrections. The Navy's current 5-inch gun can also fire a big solid bullet, but does not because they are worthless for naval missions. The reason a railgun fires just a big solid bullet is because the shock at launch and electromagnetic surge through the projectile would detonate any explosive and destroy any electronics. The 234 lb projectile fired at Mach 4.8 by the Paris Gun had only 7 lbs of explosive to survive the firing, greatly reducing its destructive power. Railguns are promoted as offering direct fire support, indirect fire support, and an anti-air capability, yet cannot perform these missions because its 24lb round quickly loses velocity since it lacks mass, contains no explosive, and cannot include electronics needed to hit long-range targets. The US Army's concept for using a railgun to penetrate thick armor with direct fire was valid. 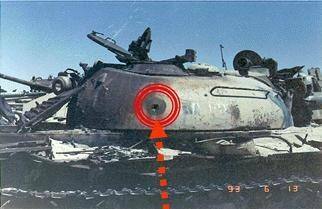 Punching a small hole in a tank kills crewmen because they are confined in a small space. (pictured) A projectile punching a hole in a ship may cause no serious damage if it has no explosive warhead. There are numerous World War II accounts of unarmored “tin can” destroyers hit by a large armored piecing projectile where it passed clean through the ship without exploding causing little damage, known as "over penetration." There is an assumption that all projectile kinetic energy is converted into heat upon impact. That does not happen if the round is too fast. The metal at the impact point is pushed aside and the round simply goes through, making a bullet hole. This is proved by railgun promotional videos and the photo below showing neat holes in metal plates. There is no explosion, so railgun bullets may hit a ship a dozen times and harm no one. Some suggest that gunners will aim for key parts of a ship, as though battles will occur less than a mile away. Assuming that a modern naval engagement occurs at less than 20 miles to allow direct fire (which is the maximum possible because the curvature of the earth) gunners will be lucky to hit a moving and bobbing ship they can barely see, much less choose where to aim. The key selling point is that railguns can launch a projectile at Mach 7 and falsely suggest that its kinetic energy will destroy targets on impact. Kinetic energy increases as the square of the velocity, so while a railgun's 24lb projectile (pictured) has three times the kinetic energy of a standard 5-inch shell fired from a conventional gun, a 5-inch has three times its mass and a 26mj explosive charge so delivers roughly the same energy to the target as a railgun bullet. This bullet loses one-third its velocity at 500 yards! Look at the ballistics of a railgun's 24lb (10,866 gram) projectile fired at Mach 7 at sea level. Results can be seen here using a G7 low drag shape, and show that it would lose half its velocity at just 2.4 miles out! When it reaches 6.6 miles it has slowed below Mach 1, so it cannot reach targets over 100 miles away as its salesmen proclaim. Such calculations are complex yet this guesstimate demonstrates the secret flaw in this program. If Congressmen saw the railgun's secret velocity/range chart, they would be stunned. One should ask how far the railgun projectiles recently fired at Mach 6 traveled, since the firing range at Dahlgren is limited to 25 miles! As already explained, a 24lb railgun bullet fired at Mach 7 quickly loses velocity due to air resistance and falls to earth at less than 10 miles out. Firing upwards in a ballistic path lessens air resistance, but this small projectile cannot reach over 20 miles since it lacks mass. Fire a sewing needle at Mach 7 and see how far it goes! 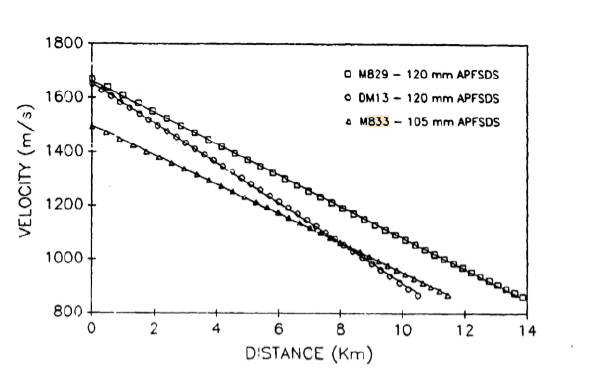 A 1988 US Army study explained: "Unfortunately, many arguments for electromagnetic guns revolve around the assumption that greater muzzle velocity is better. These parametric relationships show that this is not a strong argument." In addition, winds are difficult to predict over dozens of miles so unguided ballistic projectiles usually miss by over 200 yards at 40 miles. 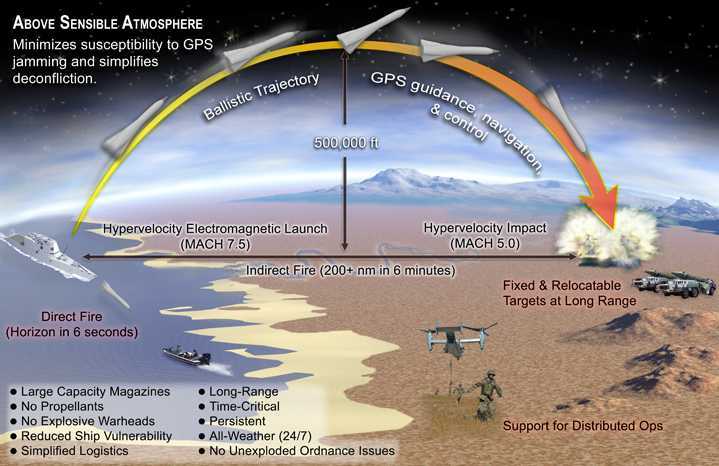 This powerpoint indicates GPS guidance will be used, but that may be impossible due to the extreme launch velocity and electromagnetic surge through the projectile. Finally, it has no explosive charge so will only punch a deep hole in soft earth, suitable for a fence post. A solid railgun projectile is only deadly for indirect fire support if it happens to hit a person directly! Some have suggested that bursting rounds could be used, but those require an explosive charge and electronic sensor fuze. Some have suggested this can be overcome with more research money, but the program has not expressed interest in adding explosives or GPS guidance or laser spot sensor electronics. Even if a solution is found, inserting a electronics package into a 24lb projectile would leave no room for payload! Most of the needed R&D was already performed to produce the LLRAP munition for the Navy’s AGS 155mm gun. The projected production cost was $800,000 a round with range and effectiveness far less than promised. These insurmountable issues were already known after the failed 5-inch ERGM program (projectile pictured) yet continued with the 6.1-inch (155mm) LLRAP program, which was recently cancelled years after G2mil highlighted flaws. This failed concept resurfaced this year with a third acronym -- HVP for Hyper-Velocity Projectile. Salesmen claim this is the result of railgun research, but these "sabot" rounds were developed during World War II. American T4 High-Velocity Armor Piercing (HVAP) ammunition became available in August 1944 for the Sherman tank's 76mm gun. The projectile contained a tungsten penetrator surrounded by a lightweight aluminum body and ballistic windshield, which gave it a higher velocity and more penetrating power. The $800,000 LLRAP gun launched missile weighed 225lbs but delivered just 24lbs of explosive, yet even with GPS guidance had a probable error factor of 50 yards! The key flaw with fielding gun rounds with a guidance system and rocket assistance is this leaves little room for the actual warhead. The Navy has 90 test LLRAP munitions left over from an early production run built to withstand Mach 2.4 firings. It could ship them to the railgun program, but they would never be fired since program scientists know what would happen. Even if the round survived the launch intact, it has nine times the mass of their current 24lb bullet, so the current huge railgun would be lucky to launch this 225lb projectile at a Mach 1 velocity. The third false selling point is that railguns are ideal for anti-aircraft and anti-missile defense. General Atomics produced a comic book video of a railgun shooting down aircraft and missiles. Fortunately, US Army officers recognized the technical impossibilities and dismissed the idea. As already discussed, range is limited to less than 45,000 feet, but effective range is less than 10,000 feet since a railgun must hit a moving target directly. This only works if no wind exists and the target remains on a perfect steady course for several seconds. But there is always wind in different directions at different altitudes, so the target is always moving slightly and the railgun bullet is pushed around too! Hitting an incoming missile head-on with a bullet is luck, which is why Navy ships have the CIWS 20mm gatling gun that sprays hundreds of bullets in a few seconds. Big guns are effective anti-aircraft weapons, but with a big explosive charge and a proximity fuze, which railguns cannot fire. 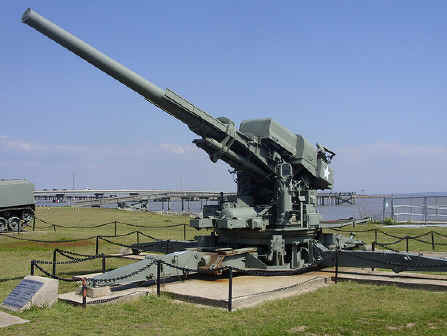 The US Army deployed the 120mm M1 anti-aircraft gun (pictured) from 1944 until 1960, when they were replaced by superior missiles. 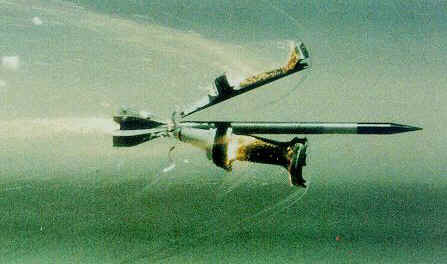 This gun fired a 50lb bursting projectile at 3100fps (Mach 2.8) up to 57,500 feet. This gun is far smaller and far cheaper than today's railgun and could fire 12 rounds a minute. The Army later developed the 120mm M829 APSFDS "sabot" anti-tank round that is fired at Mach 5! This combo could provide nearly the same capability sought by railgun proponents and prove more accurate since a rail gun projectile is affected by "atmospheric jump." However, anti-aircraft officers would bluntly explain that firing a solid bullet at aircraft is idiotic. One would have a better chance duck hunting with a bolt-action rifle than hitting a fast moving airborne target with a 120mm or railgun bullet. In addition, the M829 fired at Mach 5 loses half its velocity at 14km (9 miles) even though its rod projectile is more aerodynamic than a railgun projectile! People are stunned by these railgun fallacies because they cannot grasp the corruption in the US Navy officer corps as demonstrated by the ongoing "Fat Leonard" bribery scandal. How can an organization with brilliant officers and scientists participate in this railgun fraud? The answer is they enjoy highly paid, interesting jobs, and their careers depend on pleasing senior Admirals, who can collect more money after retirement than during their entire Navy career! 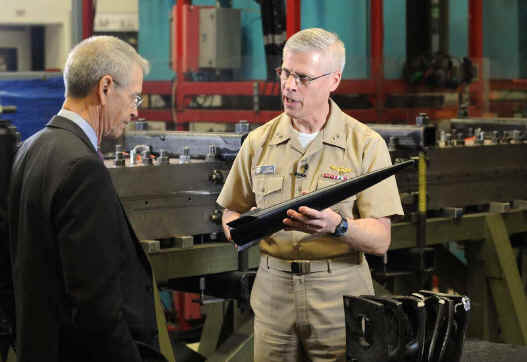 Railguns were strongly advocated by former Chief of Naval Operations Admiral Jonathan Greenert, who was recently investigated for his contacts with Fat Leonard. In 2015, speaking before nearly 3000 attendees from across government, academia, and industry Greenert declared: "Number one, you've got to get us off gunpowder," noting that Office of Naval Research supported weapon programs like the Laser Weapon System [another fraud] and the railgun are vital to the future force. "We will have an incredibly deep magazine when we bring [those weapons] in." Perhaps Admiral Greenert was incompetent and misled, but he profited from his railgun advocacy. Six months after retirement, he joined the board of directors for railgun contractor BAE Systems. Every idea is not a good idea, which is why railguns are not deployed on ships a century after they were invented. Billions of dollars of research cannot overcome the laws of physics. Good people in the Navy recently attempted to end this fraud by redirecting funding to promising Navy programs, but failed. Railgun salesmen spread rumors that Russia and China were fielding railguns. The only proof was a photo of an odd looking gun turret on an old Chinese landing ship with limited electrical power that seems to have a muzzle brake, which is only useful for a conventional gun. If the US Navy wants a hypervelocity cannon on ships, it can simply install the Army's proven 120mm Rheinmetall tank cannon, which can fire the M829 APFSDS sabot round at 5700fps (Mach 5 pictured). Despite the Mach 7 sales pitch, current railgun prototypes have only demonstrated Mach 5.8. This would cost one-tenth as much as a railgun and use one-tenth the ship space! Navy scientists at Dahlgren are aware of this capability since they often fire that round for testing. The Navy even spliced videos of a gunpowder propelled 120mm sabot round in slow motion into railgun promotional videos! Note the projectile exiting a coventional barrel. They also placed explosives in targets so they exploded when hit, but the last segment one shows what really happens, the solid projectile slices clean through and only makes a hole. Nevertheless, a 120mm sabot, like a railgun sabot, is not useful for naval missions because it lacks mass, contains no explosive, and cannot include GPS or laser sensor guidance needed to hit long-range targets. Army tanks fire different 120mm rounds for such missions that a ship version could carry, but a railgun cannot fire such rounds since it imparts a lighting bolt of electricity through the projectile that would cause it to explode or destroy any electronics. The answer to the US Navy's needs can be found in the past. The Navy developed and successfully tested the rapid fire MK-71 8-inch naval gun in the 1970s. (pictured). This can provide three times more firepower with twice the range of today's 5-inch guns that deliver just 70lb projectiles. Proven 8-inch rounds can be fitted with GPS guidance or laser spot sensors that were developed for 5-inch rounds. 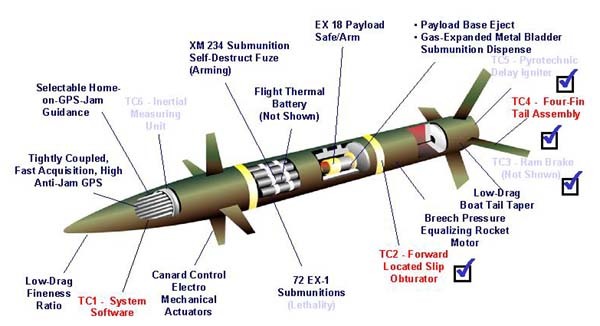 An 8-inch projectile is far more cost effective since it can use the same expensive guidance as a 5-inch round, yet deliver four times more explosive since the projectile is much larger so the guidance system is a smaller percentage of the payload. This would provide a huge leap forward, although its low-cost will disappoint those who profit from perpetual weapons development projects. The Navy determined the MK-71 could easily fit on Arleigh Burke class destroyers that are still under construction. 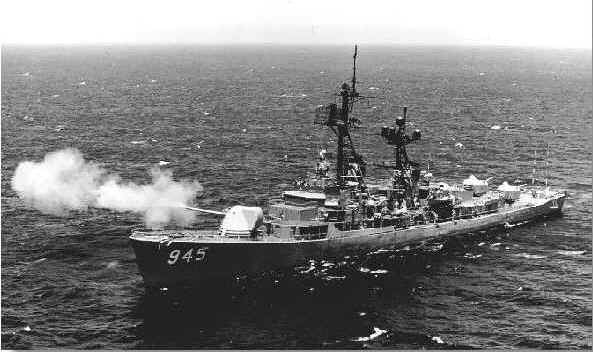 During the Vietnam war, US Navy ships fired 8-inch "super heavy" 335lb projectiles out to 18 miles and 112lb LLRB "arrow" projectiles at Mach 3.5 out to 41 miles! The MK-71 gun may not excite armchair dreamers, but its basic 260lb 8-inch round can deliver four times the explosive power two times farther than current 5-inch guns or railguns.